Oversized fast food is coming soon to a street near you. In the latest of Burger King’s increasingly desperate pleas for our attention (coming directly after the Internet ripped apart BK Satisfries), the fast food planted a giant BK carton full of foam french fries on the streets of New York, Los Angeles, and Chicago. 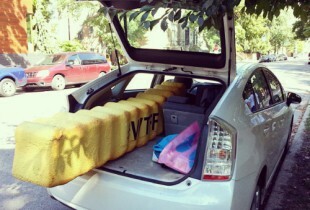 Because no one has ever been annoyed by 8-foot french fries blocking their daily commute to work. The giant fries, created in part by ad agency Mother and marketing company Big Fuel, are promoting the new, lower calorie Satisfries. 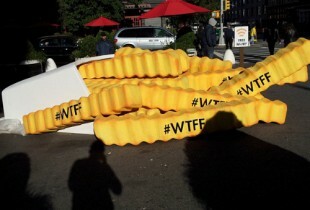 Each fry was branded with “#WTFF,” a BK-created hashtag which was used on both Instagram and Tumblr, allowing those fans who picked up a fry to photograph it in their daily life. 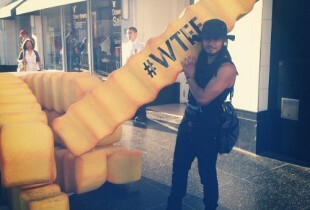 The #WTFF campaign even went so far as to photobomb the TODAY Show, with people holding the giant fries strolling back and forth in front of the windows to attract attention. It’s a shame that they didn’t photobomb Kathie Lee and Hoda. They probably need giant food to satisfy those 9am wine drunchies. There seems to be nothing we won’t Instagram these days, so Burger King was most likely right on target with their ad campaign. Although, it remains to be seen if the giant fries increase their Satisfry sales. We think not. Fries are meant to be very caloric, okay? That’s what makes them taste like salty paradise. 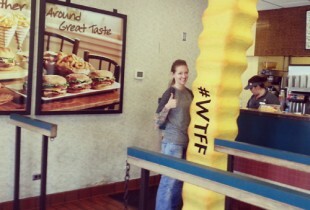 Click through the photos to see a few of #WTFF’s Instagram adventures. RELATED: The Best French Fries Around the U.S.